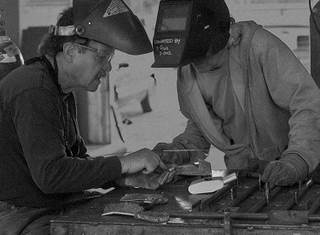 Master blacksmith Barry Stromberger leads an intensive 8 week adult welding class in the Road Shop, on the TwispWorks campus. The course, consisting of 3 hour classes each Thursday night, will cover hands-on orientation to arc and gas welding, wire feed and TIG welding, oxy-acetylene and plasma cutting. Barry will also cover metal working tool orientation; how to select basic welding equipment for your personal shop and how to identify the different kinds of steel. And, as always with Barry, an emphasis on safety will be stressed each step of the way. Barry has been a small business owner in the Methow for over 40 years and has specialized in foreign auto and custom iron work for the past 12 years. Barry developed and led the very popular welding program at Liberty Bell High School for over a decade. Cost includes all supplies and safety gear. Class size is limited to six students. This class is currently full. Contact Barry for information on future courses. The welding class is held in the Road Shop, Building #8, on the TwispWorks campus.